If you come to Sullivan's, you want to see the ocean, and you get gorgeous views and more in this charming, spacious oceanfront home that sleeps 12. Perfectly suited to accommodate 2 families, with 2 master bedrooms with ensuite bathrooms, there are 3-4 bedrooms and 2 baths on the ground floor and two bedrooms and 2 baths one floor up. Description: 5 Bedrooms (2 master suites), 4 Bath, 1 and 1/2 kitchens, 1 screen porch, 2 decks, 2 outdoor showers with privacy, large grassy backyard, 3rd floor and office blocked off, central A/C, ceiling fans in every room, 4 color TVs, 2 VCRs, 1 DVD, 2 refrigerators, icemaker, 3 microwaves, dishwasher, washer/dryer, Beds: 3 queens, 1double, 4 single. The house has new windows within the last 2 years. The outside of the house has been upgraded. Bedrooms with carpet have new carpet. We have a beautiful new dining room table large enough for family gathers, and the downstairs living room has new upholster. We do not have direct access to the beach, but there is a wonderful boardwalk two houses down with easy access to the beach. Julie and Marvin own the home, but as a friend of the family and a Licensed Property Manager, Linda Scheer manages the house. 2613 Bayonne is a great location to everything at Sullivans. A 15 minute walk down the beach will put you at all of the restaurants and parks. We take a lot of pride in the property. You will always find the house clean, and Linda is always willing to go that extra mile to ensure your vacation is pleasant and that you want to return. This house has two living rooms. The main living room is on the 2nd floor, but the first floor also has a living room which is great for children. The dining area is on the 2nd floor, which is the main living area of the house, but you will find additional tables outside in the enclosed screened porch. We do not have bicycles, but Mikes Bikes will be more than happy to deliver some to the house during your stay. You will love the views from the sundeck or the large screened porch. The 2nd floor master bdrm also has a private deck. The house is not wheelchair accessible, and please note there is a spiral staircase that leads from the 1st floor to the 2nd. We stay here annually and genuinely love the house! It is very welcoming and homey! We love how close the house is to a group of restaurants and to the beach. There is plenty of room for family and friends to spread out and the back deck is huge, functioning as an extension of the house. Linda is great to work with and she genuinely wants you to enjoy your stay. Such a great place! Wonderful time with family and friends over an extended Wedding weekend in March. 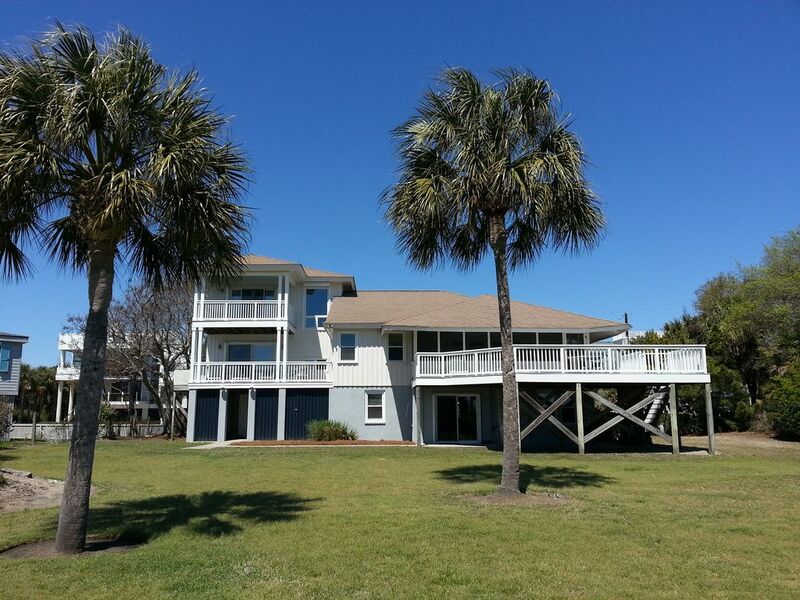 Accommodations provided plenty of space for 12 adults, wonderful access to the beach, and great views of the ocean. We enjoyed our time relaxing on the back deck or within the fantastic screened in porch. Ample room in main living area for large families to gather at night. Bottom floor is beach worn but main floor is very welcoming. Kitchen is well stocked with pots, pans, plates, glasses, silverware and just about anything you can think of. Tip for anyone who has older folks staying with them, main floor access is from outside deck steps, ground floor garage steps or inside small cast iron spiral stair case (not show in pictures) I recommend this location and hope to visit again soon. This house was perfect our group of 13. Plenty of space for everyone and the house had everything we needed. Walking distance to the beach. Only a 15 minute ride to downtown. 12 women...fun reunion weekend in plenty of space. We really enjoyed the ease of the house and walking the beach! We all had more than enough room for eating, socializing, and enjoying our family time. Thank you!